Summary: The project will create an obstacle course game to simulate obstacles and threats that face sea turtles during the nesting season. 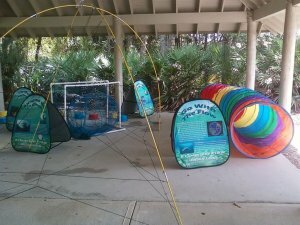 Through simulated activities and signage the obstacle course will teach participants about the ideas of migration, food foraging, predators, turtle excluder devices, monofilament entanglement, beach obstacles, false crawls, and nesting. The obstacle course will be set up at various festivals throughout Brevard and Indian River Counties. It will also be used at Riverwalk Nature Center in conjunction with the Saving Sea Turtles fieldtrip/presentation already conducted for area schools and groups. Results: All educational signage was approved and printed. All materials where purchased and frames for the TEDwere constructed. The project was promoted in local papers and trough the county newsletter. A Facebook campaign was started to give a name to the program and raise awareness. Teacher workshops were attended and/or scheduled to give out information on the free program. The program was also provided at events. There were 54 kids and 65 adults at the first event. Most of the kids went through at least once, with many going multiple times. Some went by themselves but many had the help of their parent to slow them down and take the time to read the signs. One girl went through at least 5 or 6 times.